Several large potable water reuse facilities are installing UV-oxidation systems that will use the UV-chlorine advanced oxidation process (AOP) instead of UV-hydrogen peroxide due to its lower cost and logistical benefits. The Autumn edition of Water Reuse & Desalination features the article “Chlorine Improves UV-AOP Efficiency in Site-specific Conditions”, where our Adam Festger and Scott Bindner explain the conditions under which UV-chlorine AOP makes both practical and economic sense. Below is a summary and a link to the full article. UV-AOP is a process in which UV, along with an oxidant, removes chemical contaminants such as 1,4-dioxane, algal toxins, pharmaceuticals and pesticides from water. The most common oxidizing agent in use today is hydrogen peroxide (H2O2), which is used at facilities around the world, including the Orange County Water District’s world-renowned Groundwater Replenishment System. The Orange County Water District’s world-renowned Groundwater Replenishment System uses hydrogen peroxide as the oxidant for their UV-AOP process. Recently, research has been undertaken to explore chlorine (sodium hypochlorite and NaOCl) as an oxidant for UV-AOP. The data shows that under the right conditions, UV-AOP with chlorine can provide significant cost savings compared to UV-AOP with H2O2. These ideal conditions are often presented in potable reuse applications. Quenching of residual H2O2 would be required to prevent regrowth in transmission lines. UV-chlorine removes the quenching step altogether. 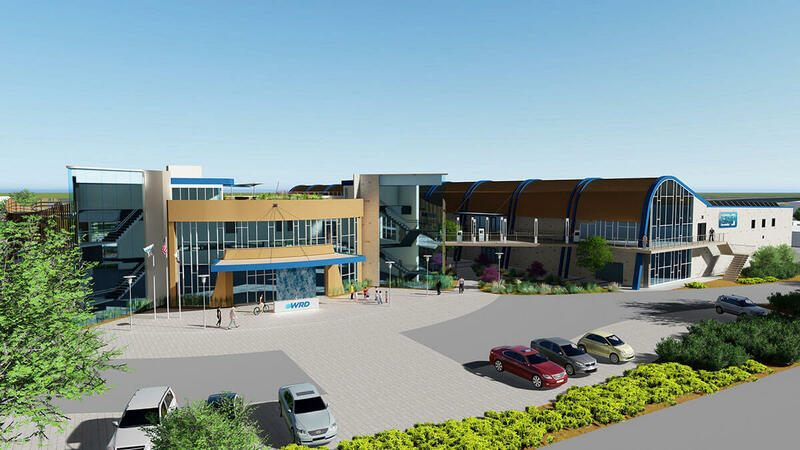 The Water Replenishment District of Southern California is currently constructing The Albert Robles Center for Water Recycling and Environmental Learning (ARC). This facility will implement an advanced wastewater treatment process for potable reuse which incorporates ultrafiltration (UF), reverse osmosis (RO) and UV-chlorine AOP. The Water Replenishment District of Southern California’s Albert Robles Center for Water Recycling and Environmental Learning has site conditions that make chlorine the best choice for the oxidant in their UV-AOP. The facility will control ammonia levels passing through RO, and by way of UF and RO, pH levels will remain low. If the facility had used H2O2 as an oxidant, quenching would have been required; therefore they have eliminated this step by using chlorine. ARC has the ideal site conditions to allow them to take advantage of the cost savings offered by using UV-chlorine for their AOP. Adam Festger: Adam is the Business Development Manager for Potable Reuse at Trojan. Given increasing global water scarcity, he is focused on expanding the use of UV light to convert wastewater into drinking water. He holds a Master’s Degree in Hydrology and a Bachelor of Science in Mechanical Engineering from the University of Arizona. He has over 15 years of experience in contaminant treatment and UV technologies and is a member of the International Ultraviolet and WateReuse Associations. Scott Bindner: Scott has spent over 7 years acting as a Market and Applications Specialist for UV Advanced Oxidation Systems at TrojanUV. He has a Master’s in Biochemisty and a Bachelor of Medical Science Degree in Microbiology and Immunology.